The files are now properly marked. The Chiseled Armor portion is Amazing, however, when I equip the arm and leg parts they do not move with the player, can you please explain how it is done? Thanks! 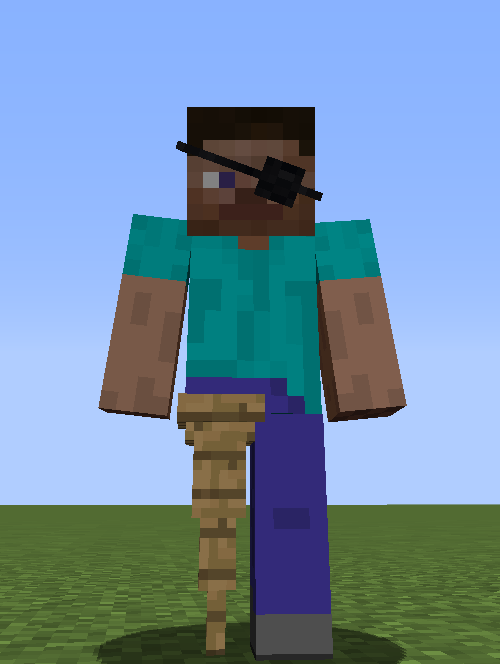 Be sure to import block copies into the arm/leg moving parts as well as the torso/pelvis moving parts. See the tool tip for controls, like changing the selected moving part. Loving the chiseled armor portion of the mod! 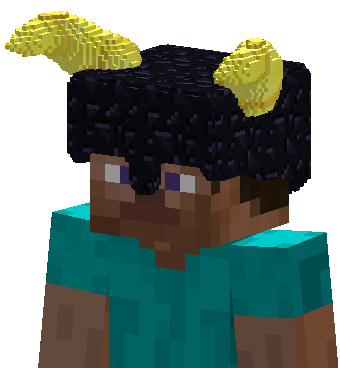 I must reiterate a strong interest in compatibility with CustomNPC's npc entity ; That would effectively allow pack/map makers to create their own chiseled NPCs and mobs. It would make of EBM a powerful tool for adventure map creation! Additionally, could there be some method to automatically place a chiseled armor piece on a player's cosmetic slots? Either through command or through a GUI'd block that accesses a specified player's cosmetic slots? Such would make dynamic chiseled-armor change/selection possible from a map-maker's perspective. Thank you for your consideration and putting work on this indispensable addition to C&B! As for CNPC integration, feel free to jump in on the the GitHub issue regarding it. Thanks! I've posted a follow-up with precisions on the issue on github. Additionally an issue has been opened on the CustomNPCs curseforge page. Plenty of features from AW would be welcome additions to the chiseled armor. 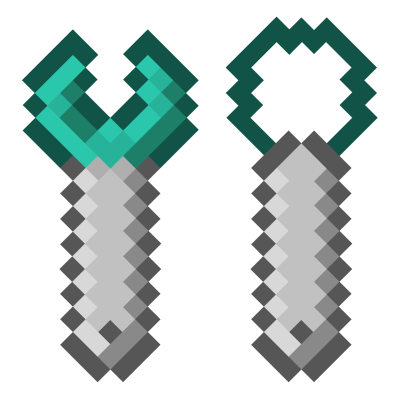 Slots to render player-made objects as replacements for held items (Swords, Bows, Shields). Ideally in regards to the last feature, the ability to simply make the item as is and then specify its nature, stats and function (sword, tool, shield, bow&arrow, armor, gun?, etc) would be complex but powerful in packmaker hands. For instance, the ability to make a chiseled armor piece, or tool/weapon/shield/etc, define its stats, material, function and then model it in-game like currently, would be a very powerful tool for pack & map makers. It's also worth noting that AW is open source and has full compat with CustomNPCs. Despite it being several versions behind, its code or author may have a hint regarding the rendering of Chiseled Armor on the default CustomNPC entity. Thanks for the quick response, quite eager to see what you do with EBM! I hadn't heard of it, no. It appears to have quite an expansive feature set, by the looks. As for the rest of what you said; most -- if not all -- of those points seem doable. As things stand now, unsurprisingly, I've coded everything to do with chiseled armor strictly assuming that it is armor; but there is nothing, in principle, that would prevent the core of it from being used by other items. Add the means of mapping any of those generic chiseled items to sets of any other items in the game. If any held item matched (by item and optionally meta and/or NBT) a chiseled item, it would render that chiseled item as if it were the held item. 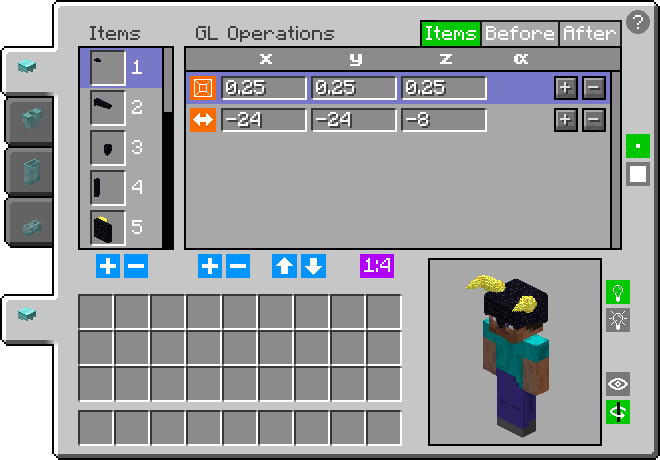 For items more complex than shields, sword, shovels, etc., like bows (which require multiple render stages and the rendering of arrows), add a dedicated version of that item, which could have multiple chiseled items/blocks stored in its NBT (three items, in the case of a bow, as well as arrow placement data for each stage). Add a block (or perhaps by some other means -- adding a capability to a preexisting tile entity, perhaps) that stores chiseled items/blocks and renders them with user-specified translation/rotation offsets. These are just ideas, and all this (as well as the other things you mentioned) would certainly take a lot of time and refactoring to implement. I make no promises about any of this, but I'll definitely give it a go. As of right now, all I've implemented is one of the two things you mentioned previously: namely, I've hooked into the vanilla /replaceitem command and modified it to set the contents of the vanity slots (its tab completions are modified accordingly). I should probably look into CustomNPC integration next. I noticed the recent commit regarding /replaceitem. Thrilled to see it implemented! Thanks for looking into it and the CNPC hiccup! Each of these potential feature implementation methods are quite sound. I can definitely see how those are fairly daunting concepts to organize and retrofit in code ; Quite thankful to hear you'll at least give it some thought. Chiseled armor renders the same when worn in a vanity slot as it does when worn normally (it just doesn't take up a normal slot, allowing you to wear both it and normal armor). See the 'Vanity Slots' section of the 'Chiseled Armor' link below and above. how do i make the armour? I am very confused by it. The 'Chiseled Armor' link above (and again here) should be helpful. In short, you set an area in the world that represents a body part at a given scale, sculpt a model around/in it, and then draw a box around part/all of the blocks of the model you created to import copies of those blocks into an armor piece's moving part. Any chance you could make a video to show how the armor creation works? I also need this! I've been trying to figure it out for days now. 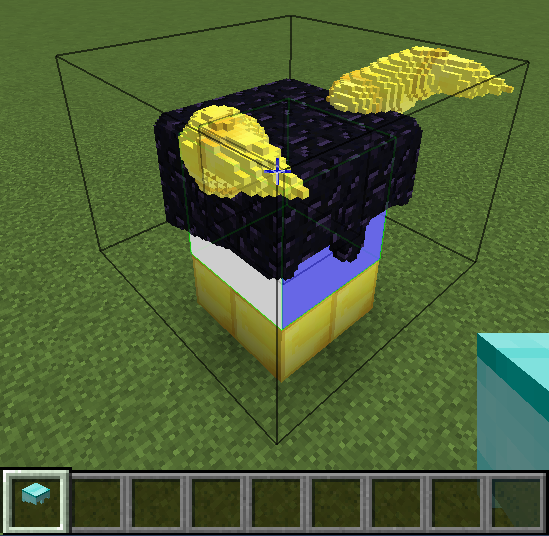 The recipe says to put an armour piece in the centre of a 3x3 crafting grid next to "any" chisel. The recipe isn't working for me, is there a setting that needs to be enabled somewhere? There is now a tutorial video on this overview page. The Armor feature looks so freaking cool!